JB115 Turquoise Applique Crystal Rhinestone Silver Beaded 4"
Catalog > JB115 Turquoise Applique Crystal Rhinestone Silver Beaded 4"
One of our most popular designs, JB115-TRSL Turquoise Rhinestone Beaded Jewel Applique is the perfect balance of sparkle and class for embellishing clothing and costumes, creating fantastic home décor, or even designing custom jewelry. 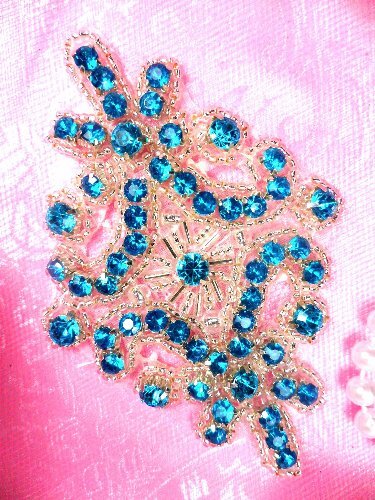 This turquoise crystal rhinestone and silver beaded applique is approximately 4”x2.75”, and features stunning high quality stones in a vibrant hue, perfect for your “something blue” or any other project that needs a colorful touch. Lovely as a headband, barrette, or brooch as well, this pretty piece can also be used to create stunning patterns!